Toronto gets a bad rap from the rest of the country, and now increasingly from around the world thanks to "he who shall not be named" (let's not give him any more publicity). Too many people, too much traffic, unfriendly, obsolete transit systems, ridiculously high real estate prices, too violent, thinks it's the centre of the universe, terrible sports teams, etc. One of the themes of this blog will be, unapologetically, Toronto; it's in the name and the description, and the reason is that the city itself plays a big part of my life. We have lived here for over five years and, although we were admittedly skeptical at first, we love being here and have no plans to leave. As much as I love visiting the East Coast, where I grew up, I am always glad to be returning to Toronto at the end of a trip. Yes, I get frustrated with traffic at times, and yes, I wish it didn't cost as much to buy the sort of house we want, and yes, I wish we had a City Hall that could make up their mind about transit, but I'm willing to accept those things in exchange for the restaurants, parks, attractions, and overall energy of this city where there are endless possibilities. 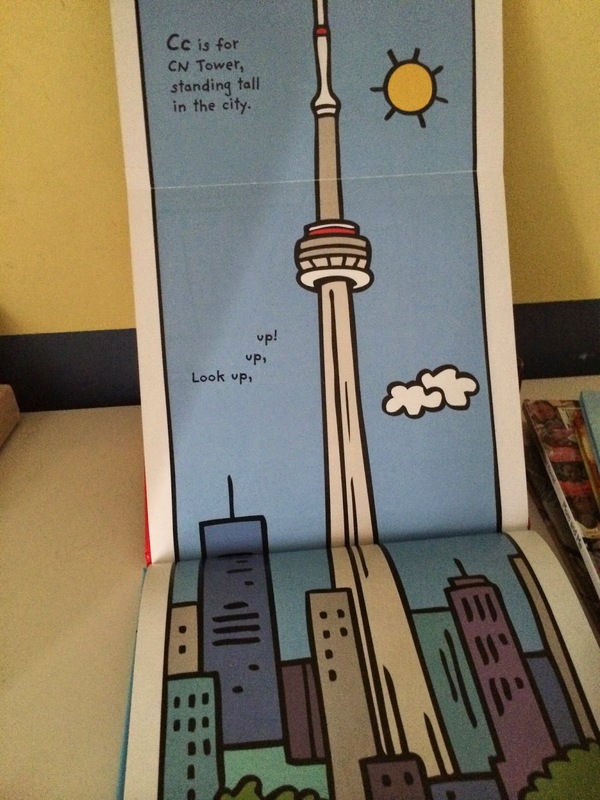 C is for CN Tower, and the page unfolds to reveal the tall tower. 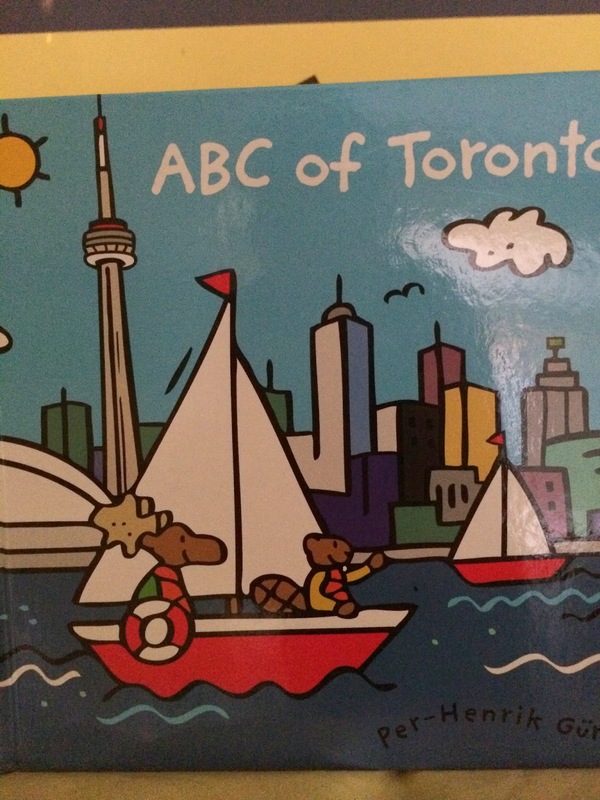 E knows this tower very well and says it is in "Toronto City!". I am glad he is as excited about this city as I am. He loves riding on the streetcar, and the GO Train. We try to take him to many different restaurants, and we have hit the high spots of the Toronto Zoo, the Science Centre, the new Aquarium, the Canadian National Exhibition, and so much more. We have taken E to several Blue Jays games and one Raptors game. One of the great things about Toronto is that there are always new places to explore, and you still want to revisit the places you've already been. What I love best are those moments when I look around and realize how lucky I am to live in this city - quiet moment by the lake with the skyline in the distance, hearing numerous languages being spoken on any given day, going to one of the many playgrounds with E, or exploring new places and spaces. Sure, it's not perfect, but it is our home, and we wouldn't change it for anything. No matter where you live, take time to appreciate it and enjoy it. And even if Toronto doesn't seem like your thing, try visiting, you may be surprised. My brother moved to toronto last month for 1 year! I intend to see the city way more now! !